Brackley’s promotion hopes are over for another season. 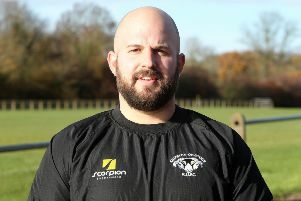 They were overpowered by second-placed Sileby as they lost 26-14 in Saturday’s Midlands Four East South fixture. Brackley had to win their remaining games and hope their rivals slipped up but it was not to be and they slipped down to fourth. From the start it was obvious that Sileby had the size and power advantage, especially at scrum time. The visitors started much the stronger controlling possession deep within Brackley’s half as they looked to power their way over for an opening score. The hosts showed strong defence to keep Sileby at bay before they broke through to score. Sileby didn’t let up and kept the pressure on Brackley with their strong direct running. After Brackley fell off some attempted tackles the visitors were quick to recycle the ball and score in the corner. When they did have the ball, Brackley looked to play an up-tempo game trying to get it wide and throwing off-loads anywhere on the pitch but for much of the game the ball wasn’t going to hand and this simply led to turnovers. Brackley finally started putting some phases together and quickly had Sileby on the back foot before they were reduced to 14 players for ten minutes in the sin-bin. Brackley took advantage and second row Jonny Morris powered his way over from close range. The second half was very similar to the first with Brackley mistakes gifting the ball back to the visitors who could rely on their scrum and big forward runners to dominate territory and put pressure on the home side’s line. Sileby crossed for their third try after some sustained pressure in the Brackley 22 to make it 19-7. With 20 minutes to go Brackley did get back on the scoreboard as they showed good hands to get the ball wide to Phil Brinklow who stepped inside and scored under the posts. With only five points in it, there was a sense that the hosts may pull off an unlikely win despite a performance that was well short of their usual high standards. But the visitors got their bonus point score with a try that encapsulated the game, Brackley got a turnover on their 22 and tried to get it wide early but a misplaced off-load led to a loose ball which was kicked through for the final try.